(Photo courtesy Fox News Channel) Abby Huntsman has left the weekend edition of "Fox & Friends" and will join the panel on "The View." Huntsman bid farewell to the weekend edition of “Fox & Friends” on Sunday; she’ll be joining joining Whoopi Goldberg, Joy Behar, Meghan McCain and Sunny Hostin on ABC’s weekday morning show (10 a.m., KTVX-Channel 4). And I think it’s a great move, for Huntsman and for “The View.” Huntsman is smart and articulate, and she’s got a sense of humor. She’s a conservative, but she’s not a zealot. She can get her point across without getting angry, which will be a nice contrast to the only current conservative member of the “View” panel, Meghan McCain. I know, I know. It sounds like I’m sucking up to the boss. Abby’s uncle Paul Huntsman owns The Salt Lake Tribune. He signs my paychecks. But Paul Huntsman announced he would buy the paper in April 2016. I interviewed Abby Huntsman in late 2014 — and came away impressed. Our scheduled 20 minutes turned into something closer to an hour, and I was genuinely struck by her honesty, her intelligence and her willingness to answer questions about herself and her politics. At the time, Huntsman was one of the hosts of “The Cycle” on MSNBC — and the only conservative on that panel. Not only did she disagree with the more liberal panelists without being disagreeable, she managed to find common ground. 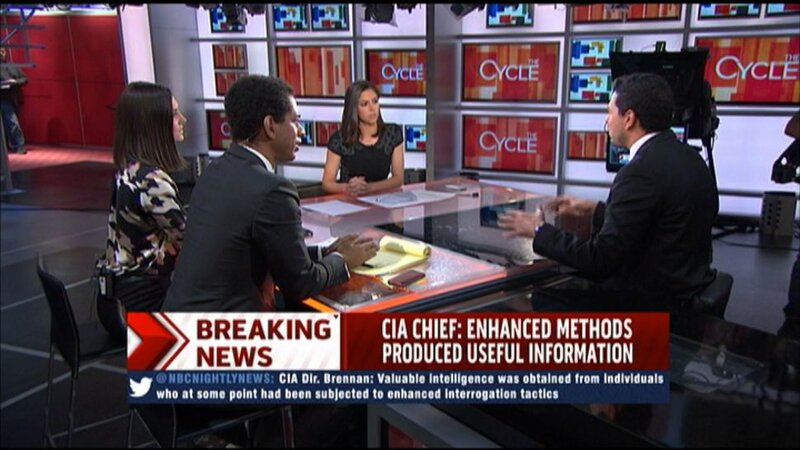 (Photo courtesy of MSNBC) Krystal Ball, Touré, Abby Huntsman and Ari Melber on the set of "The Cycle." Certainly, the fighting won't disappear from “The View. It's what makes it the show that it is. It drives ratings. Huntsman will be expected to argue with McCain against Goldberg and Behar. And her father, former Utah Gov. Jon Huntsman, is the U.S. ambassador to Russia. Abby Huntsman also differs from Trump in that she can admit a mistake. C’mon, it was kind of funny when Huntsman misspoke on air a couple of months ago, before Trump met North Korean leader Kim Jong Un. She apologized on the air and on Twitter. And anybody who took offense is not worth worrying about. ABC has yet to announce exactly when Huntsman will join “The View”; look for sometime in September. At 32, Huntsman is a rising TV star. This is a great career move. It will be fascinating to see how this works out. I expect it will turn out well for her and for viewers.